Most things in my life don’t go as planned, so I should have known that an anniversary celebration would be no different. Chris and I had planned to venture up to City Island, bike around for the day, have a lobster roll, and then treat ourselves to a fancy dinner Saturday night at August on Bleecker Street (which I was very excited about). But Hurricane Irene had different plans for us. On Thursday, we decided we would go to the Jim Henson exhibit at the Museum of the Moving Image and maybe a movie, as a backup rain plan instead of City Island, and then to dinner. Big grey rain boots didn’t really go with my outfit, but I’d make it work. Friday afternoon, Bloomberg announced that all subways and buses would be shut down at noon on Saturday. Ok, we thought, we’ll take a cab. And then the restaurant called to say they were closing in preparation for the storm. And then the Museum closed, and the movie theaters, etc, etc, etc. Onto plan D! Grocery store and Netflix. Chris and I planned out a few days worth of meals, just as a worst case scenario, including lemon pepper shrimp linguine, bread and cheese, wine, and salad for our anniversary dinner. But what would dessert be? Baking cookies or brownies didn’t seem special enough, so I reached for my Moosewood box of recipe cards that I picked up in Maine. 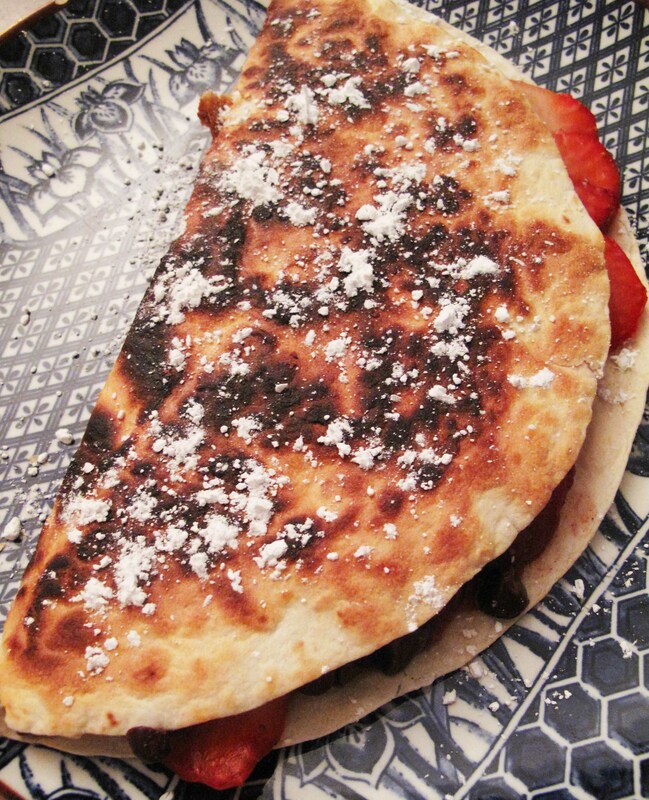 Strawberry chocolate quesadillas? The recipe was in the “Spring” season section, but I didn’t care. Immediate winner. It’s pretty simple really: slice up about a cup and a half of strawberries, mix in a little confectioners sugar and cinnamon. 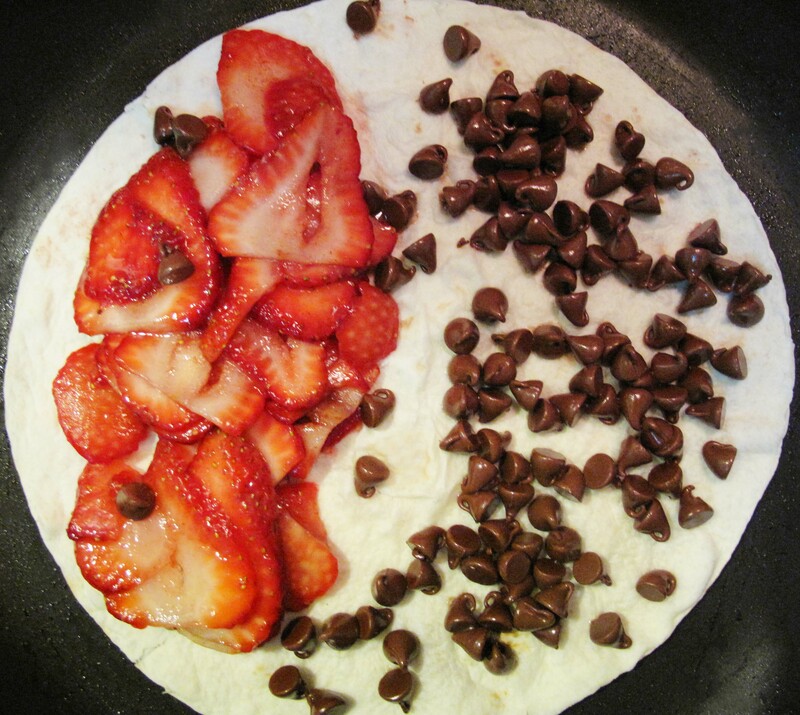 Place a tortilla in a lightly oiled pan, cover one half with the strawberry mixture, the other half with chocolate chips, and when the chocolate chips start to melt, fold it in half. Serve with a sprinkle of powdered sugar, and whipped cream if you like. We decided it would also be great with bananas… or nutella… or ice cream… or pretty much anything. We even made another batch for breakfast the next morning. Because dessert for breakfast is totally allowed on special occasions. This entry was posted in Cooking adventures and tagged dessert, fruit. Bookmark the permalink.